THE SITE HAS A NEW BIGGER FAMILY CLUB LIVE ENTERTAINMENT.SKY SPORTS. AND AMERICAN STYLE DINER.FREE ADMITION FOR EVERYONE WELCOME.ARCADE AND A NEW CHILDREN'S SOFT PLAY AREA.AND IN SUMMER HOLIDAYS FACE PAINTING ARTS AND CRAFTS.FOOTBALL PENS.AND BASKETBALL COURT.ADVENTURE PARK ON DIFFERENT DATES CLIMBING WALL AND BOUNCEY CASTLE..ALSO ON SITE ARE GOLDEN GATE CHIP SHOP AND GENERAL STORE.A LAUNDRETTE.HAIR DRESSERS AND TANNING SALON.THE CAMP HAS WIFI.ASK AT RECEPTION ABOUT USE.BINGO EVERY NIGHT CAMP OPPOSITE 2 MIN WALK. LOCAL FACILITIES 2 FUN FAIRS GIFT SHOPS ARCADES.AND RESTAURANT ALL WITHIN WALKING DISTANCE.BUS STOP RIGHT OUTSIDE CARAVAN SITE BUSES TO RHYL COLWYN BAYAND LLANDUDNO. PENSARN IS NEAREST TRAIN STATION.THERE IS ALSO A LARGE CAR BOOT SALE AT TIR PRINCE.ON THURSDAY SATURDAY AND SUNDAY AND BANK HOLIDAYS LOCAL SWIMMING BATHS AND SPORTS CENTRE IS IN COLWYN BAY. * A DEPOSIT OF £50 OR PAYMENT IN FULL SECURES ANY BOOKING DEPOSIT NON REFUDERABLE..BUT DEDUCTED FROM FINAL PAYMENT. PAYMENTS CAN BE PAID VIA PAYPAL LINK,.CHEQUE / POSTAL ORDER. OR AT RECEPTION DAY OF ARRIVAL. We had a lovely week in a lovely, clean, caravan that is equipped with everything you could possibly need. The kids were made up with the choice of character beds and the bed in the double room was very comfy. had a great week with my family caravan is lovely we have stayed there two years ago and it is just as lovely as then my grandchildren had a great time the site was good and very clean there was lots to do so close to everything it was nice to meet you both when we were leaving . Thank you ANGELA and DON,for the use of your caravan,myself and my wife could not find fault with your home from home,spotless and very comfortable,facilities brilliant.Will hopefully be with you again next year and will be spreading the word.once again thank you very much. We just came back from our stay in this beautiful caravan,the best I have ever stayed in on golden gate ,and I have been going there for many many years,the caravan is immaculate,you have everything you need for your holiday and a lot more ,and plenty of things for the children,the bedrooms for the children are lovely ,even thought we didn't have little ones with us ,there is a secured garden area and seating area ,even a washer and dryer ,loved it so clean and bright I want to go back loved it so much . A really beautiful caravan, a real home from home. The facilities included are fantastic, washing machine and drier, iron and ironing board, washing line thingy, George Foreman grill, Bbq, coffee maker the list is endless. Shop on site is reasonably priced and the Cod and chips at the chippy is delicious! We had great weather as well which was a bonus. The owners Angie and Don have really thought of everything. Lovely people to deal with and excellent communications at all times. Much better than caravans we have hired direct from Haven in the past. Plenty to do around Towyn, Rhyl, Prestatyn, Talacre etc. Some lovely days out for the kids to explore. Would definitely book here again, I'm keeping Angie and Don's number safe for the future. Thanks for a lovely week! Excellent choice of caravan, Owners were easy to deal with regarding rental and details re site. Easy access for all amenities on various sites, great base for touring round North Wales attractions. 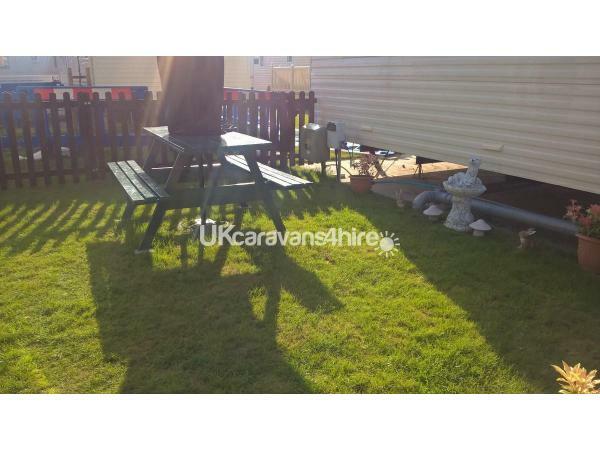 Beautiful caravan, stayed in lots this is by for the best, everything you could need. And more a real home from home, soooo clean can not fault at all, fenced yard was a god send for my little monster, cot bedding high chair, so so lovely, and the owners could not be more lovely, agent out of there way to help me in so many ways, I'd like to thank you for all your help ange and don, highly recommended A** from all of us. I have stayed in many caravans and i can honestly say that this is the best by far. The amount of DVD's and PS2 games was amazing and kept the children good when the weather wasn't at its best. 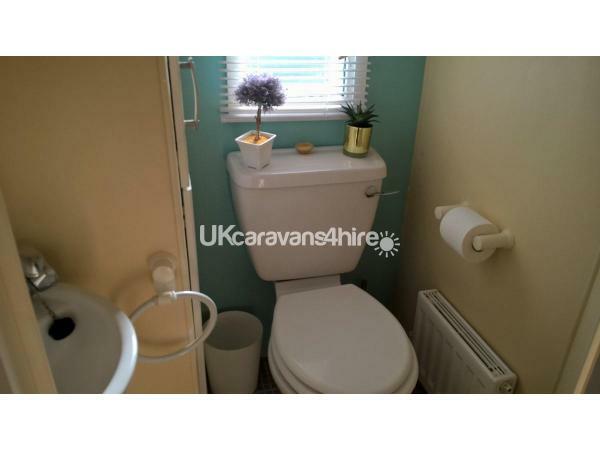 The fact that the caravan had a second toilet was extremely useful as well. We were amazed by the amount of plates and other kitchen facilities that were available. The cleanliness of the caravan was exceptional. The central heating and large shower were also pleasing to have. Thank you for letting us stay in your home from home and we have already recommended this caravan to our other family members. Thank you Angie and Don. We were surprised how lovely the caravan was on arrival with the cleanliness and how everything required for a fantastic holiday was provided for. It was a home from home with DVDs and a PS2 to keep the older kids occupied when it rained. A fantastic time was had by all. Highly recommended. Well what can i say what a fantastic caravan it as everything that you need . Very very clean and tidy lovely soft quilts on the beds can not fault it best one we have stayed in by far and we have stayed in loads over the years . Great communication with owners helped us to find wheel chair hire will use again thank you . Amazing caravan it had everything you needed, a complete home from home. Nothing was too much trouble thank you Angie and Don for a fantastic holiday, we have already recommended it to our friends. Amazing holiday had by our family!! What you see is what you get. This caravan is more than a home from home. We cannot fault a single thing. Everything you need under one roof. We've stayed in some caravans but this is by far the BEST one. Thank you so much to Ange and Don. We cannot wait to return next year!! Had a fabulous time here. Caravan is amazing,couldn't of asked for anything more. Will be going back. Angi's caravan was perfect for our requirements, it's clean, comfortable and is stocked with everything you might need to have a trouble-free break. I would certainly recommend it for couples like ourselves or families with children. Certainly a home from home!!! Me and my fiancÃ© have just come back from our stay in angies fantastic caravan . Very clean got everything you need , very much a home from home caravan . Got to be best caravan stayed in value for money excellent . And the service from angie herself was brilliant gave us information about every question we asked very helpful. Can't wait to book again !!!!! An absolutely fantastic caravan with everything we could wish for in. 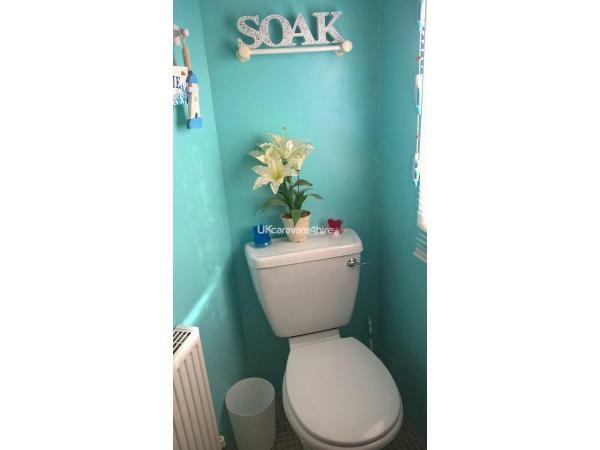 Extremely clean and tidy with exceptional facilities. Extra points given for all the child items included which saved us a lot of bother in the travel department. Great communication between us and the owner nothing ever too much trouble. Already booked for the same week next year. A massive 5* off all of us who stayed there and look forward to staying there again. Fantastic caravan for a family holiday everything you could think of just like home. Well looked after modern,comfortable and very clean. Good fenced area outside van for our 3 year old grandson to play safely. Our 14 year old grandson was very impressed especially with the tv in the bedrooms. The second loo was ideal too! Simple booking process via the owner. Would recommend. What a fantastic time we had a real home from home . And would highly recommend to anyone to book this caravan ! It had everything you could need and much more !!! And was spotless in everyway the children really enjoyed being able to play outside and being gated in was just brilliant for me having 3 small boys under 5. and I would certainly recommend it to my friends and family . Great caravan with perfect facilities for a family with younger children. Great service from the owner with all the added extras you would ever need for your stay. Exceptional standard of cleanliness and Overall quality of furniture and fittings have been very well looked after. So impressed that we have already rebooked for later this summer. Booking process was simple and site reception was friendly and provided helpful advice about the sites facilities and activities available in the local area. Overall great stay, couldn't ask for more for a family getaway.